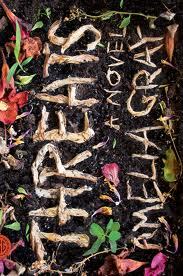 The opening chapters of Threats by Amelia Gray can be read at Newfound. For a listing of AWP events featuring Gray, click here. Reviewers love a page turner. It’s the highest praise a book can receive, right? The story becomes so tense that you begin flipping pages, moving from highlight to highlight: dead body, mysterious note, late-night phone call, threatened detective, terse cover up. Soon you’re skimming, propelled by the urge to find out what happens. All those words on the page actually get in the way. They slow us down. We might even ask, what are they for? What is the purpose of words in a page turner? Amelia Gray answers this question in her novel Threats. She takes a genre (murder mystery) that we know so well that the usual stories make an impression only by being more exciting, more page-turning, than the rest. But Threats scrambles the form, shaking us into paying attention. The novel was published by Farrar, Strous, and Giroux (and named a finalist for the PEN/Faulkner Award), and you can read the opening pages here at Newfound. The novel also mixes up the order in which information is revealed. Rather than telling us that Franny is dead at the beginning, the novel first shows us Franny’s magazines, her height, and the backstory of how she met David. Even her death scene is scrambled. When the paramedics arrive, David sees himself (and his wife’s corpse) through the eyes of the fire fighter. As a result, we’re disoriented. We know we’ve seen this premise before, but it’s so unrecognizable that we’re forced to slow down and pay attention. As a reader, you may hate this. Or, you may love it. If you do—if you want your eyes held to each word , never skimming—then try this exercise to help achieve the effect in your own writing. Pick a scene you’ve already written or begin a new one (Here’s an easy way to begin: two or more people in a specific place, in the midst of a long-simmering argument). First, introduce the reader to the scene with a wide frame. You’ll not only show the people involved but also the space around them—the room, the building, the surrounding land. The frame will gradually narrow and focus on the individuals involved in the scene. For example: The park was green and shaded except for three picnic tables where the trees had been cut down. This was where Mark and Grace were setting up for the party. Every other table was taken. The temperature was barely 80 degrees, but they were already drenched in sweat. Now, take that same scene and introduce the reader to it using a narrow frame (like Gray does in Threats). Squeeze the reader’s view as small as possible, focusing on a single item or even part of an item (such as the package, the tape, the fingernails in Threats). The frame will gradually widen to include the people involved and perhaps even the place. Neither frame (wide or narrow) is by default better than the other. Each is simply a tool that can be used. The second exercise focuses on the release of information. Choose a sequence of events that culminates in an action that cannot be undone. For example: Eat, wash dishes, break plate. Here is the sequence in Threats: Franny hurts herself and dies, paramedics arrive, ashes arrive. Write a paragraph for each part of the sequence. Each paragraph will focus on one part. You can also write a paragraph that sets up the sequence. Once you’ve written the paragraphs, scramble the order in which they appear in the story. Here is how Threats scrambles the sequence: box of ashes, backstory (setting up sequence), Franny’s injury, paramedics, Franny’s corpse. Happy writing. Also, if you’re at AWP, you can catch Amelia Gray every day of the conference. For a schedule of events, click here. I found this excerpt really fascinating. I’m interested in the idea of disorienting the readers, but I wonder how it can work across an entire novel, I can see it more easily lending itself to a clever short story. BUT, I really want to read on, tempted to buy this book! I had to read it a couple of times to get my head around what was happening, I like when that happens in a short story, not so much in a novel. Did you buy the novel? I’m curious. You’re right that any novel that works by disorienting readers will work much differently than one that moves in a more conventional manner. Let me know if you read the book and what you thought. I’ve promised myself not to add to my kindle until I read at least half of what is in there! I just got tenth of December from the library, and very much looking forward to reading more of his work after reading that story on here.